The issue of the future of Key Arena has been raised many times though out the discussion surrounding Chris Hansen’s SODO Arena proposal. As people have continued to complain about the future of the remodeled Seattle Center Coliseum they have forgotten about the future of one of its most lucrative and loyal tenants. 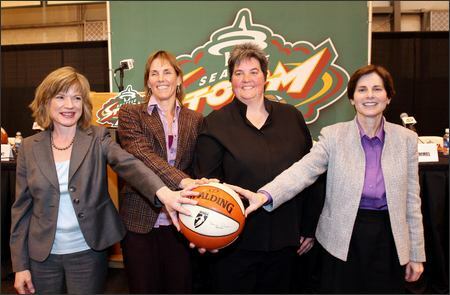 That tenant that I am talking about is the forgotten professional basketball team in Seattle, the Seattle Storm. The fact that the Storm continue to exist after the departure of the Sonics is due to the commitment of its, strong-willed, ownership group. This ownership group bought the squad from Clay Bennett and his cohorts just as it looked like they were about to join the Sonics on the road to Oklahoma City. In other words this ownership group managed to do what Steve Ballmer failed to do, save their favorite professional basketball team; and in doing so they helped bring the City of Seattle its third Professional Basketball Championship Trophy (the Storm’s second). While this quote sums up why the Key Arena is not a viable permanent NBA Venue it also ends up inadvertently asking this question; how long is the Key going to be a viable WNBA venue? Despite having one of the most favorable leases the City could offer, Force-10 is still losing money. Now part of that is the fact the venue itself, the Key Arena doesn’t have enough shops or any restaurants to help increase the revenue for the teams and the city; the other part is the league that he Storm are a part of. After 16 years you would have thought that the WNBA would have the majority of its teams earning profits and the league would be weaving its way into the fabric of American professional sports. Unfortunately the WNBA is struggling because only three of its teams reported a profit after the 2011 season and the league is subsidized by its older brother, the NBA. And since most Americans don’t pay attention to the WNBA its marketability to TV companies almost nil. While the Storm can’t cure the WNBA’s ills, they can definitely fix some of their own financial problems. By moving into the SODO Arena the Storm will open up new revenue streams. The new arena will have more luxury seating options, more concession stands, and more shops than the Key Arena; it will also have restaurants with the Key does not have. Basically the Storm would be able to take in more cash at the new building in a game than they ever could at Key Arena; that could help limit, or even completely stop, their monetary losses. It would make fiscal sense for them to move into the new arena; even though their departure would pretty much condemn Key Arena to its death. Previous Previous post: Seahawks Late, Come From Behind, Victory Is A Plea For The Regular Officials To Return. Next Next post: College Football Picks Week 5!